The Nachtmann Vivendi stemware line is a welcome blend of elegance and accessibility, making it a perfect choice for everything from a weeknight dinner to a stylish cocktail party. Created by renowned crystal company Riedel Glassworks in Bavaria, the glasses feature classic European silhouettes and a platinum finishing process for durability and shine. Lovely elongated stems distinguish the wine and champagne pieces, while subtle curves add understated flair to the beverage glasses. This set includes four Nachtmann Viviendi Bordeaux XXL glasses and a Speigelau Hybrid decanter. With a large rounded bowl sitting high on a slender stem, the Vivendi XXL Bordeaux glass is just the vessel for your favorite merlot, cabernet sauvignon, and, of course, Bordeaux vintages. 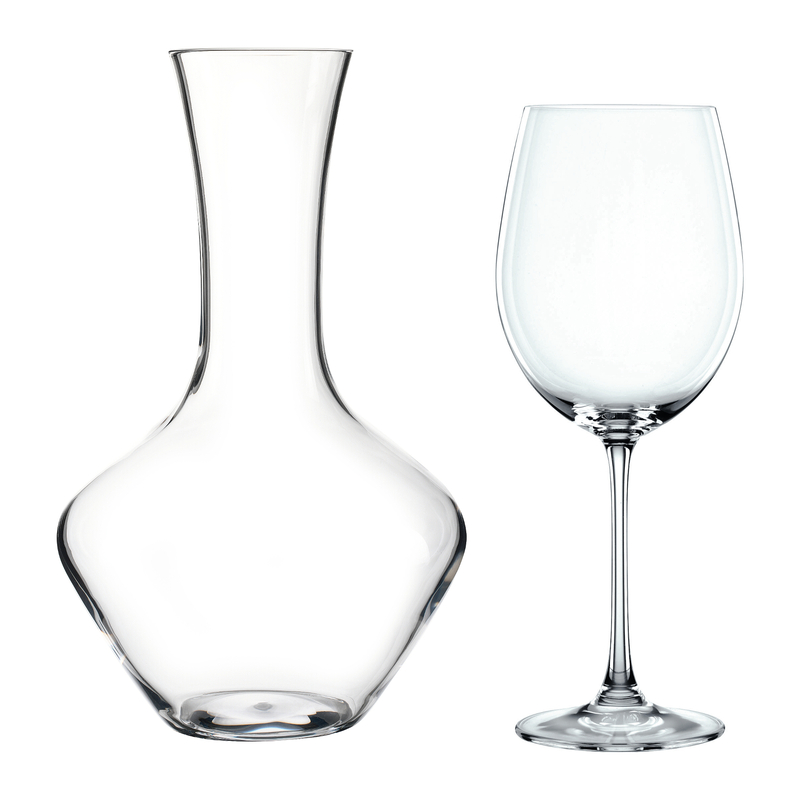 Get the full aroma and flavor from your wine with the Spiegelau Hybrid crystal decanter. The curvaceously compelling shape allows the wine to flow over its curves to maximize the flavor and aroma of each glass. Expertly crafted with non-leaded crystal, this decanter is made to the highest quality and has a brilliant shine. With an improved resistance to breakage, it will perform for years to come with a gentle hand washing.